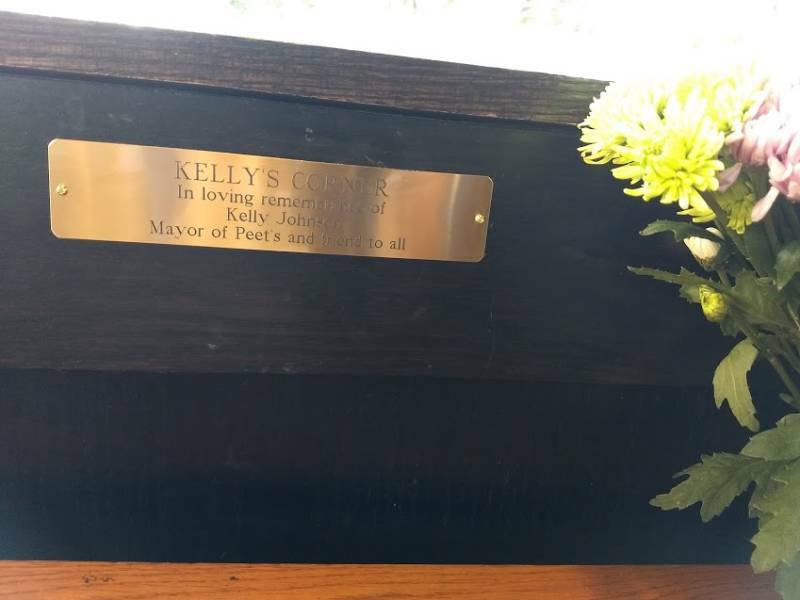 Last Monday, the day Kelly Johnson planned to end his life, he started the day with a trip to Peet's. He marked the occasion on Facebook. "Today is my last day on earth as I know it!" Johnson wrote. "I slept very well and am getting ready for a community celebration at Peet's Coffee; our little piece of San Francisco where we've established a phenomenal history of greeting each other every morning for many years. One last time today!" 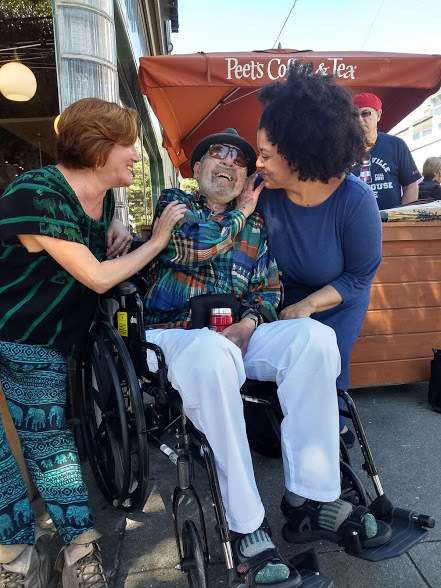 An audience was waiting for him at the Fillmore District coffee shop, where the 75-year-old could be found any day of the week holding court from his wheelchair. There, the shop revealed a new plaque dedicated to Johnson, near where he always sat. Because Johnson had dedicated nearly his entire life to the arts, friends and family made the event an artistic affair. The sidewalk leading to the shop was decorated with feathers, and New Orleans jazz was on the radio, while a stream of folks said their goodbyes. When the sadness became palatable, jazz singer Kim Nalley broke into the song, "When You're Smiling." "Because he always had the most beautiful smile, no matter what’s going on," Nalley said. When he felt ready, Johnson went home to his apartment. There, he listened Chopin before taking the legally prescribed drugs to end his life, which he chased with some tequila. He then fell asleep. Not long after, he passed on. "It was a peaceful and impeccable death, every detail exactly as he had wished and been describing in the weeks beforehand," Johnson's daughter Leda Meredith wrote on Facebook. Johnson choreographed his death like a performance. It was a fitting end for a man who spent the majority of his life on or around stages, either performing or working behind the scenes. His artistic life began at the age of six, when his mother enlisted him and his sister to perform acrobatic routines in the Chicago vaudeville circuit. The duo worked well into Johnson's teens, but it meant he spent his childhood working constantly and unable to make friends. When he became an adult, he had no plans to continue performing. Then he moved to San Francisco in the '60s. He met his soon-to-be wife, ballet dancer Penelope Lagios, and before long he was back on stage again, dancing with the San Francisco Dance Theater. He and Lagios ran both a dance company and a school that served as many as 1,400 students during the "dance craze" of the '70s. 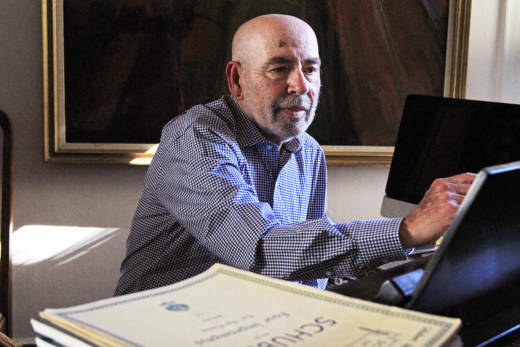 In the '80s, Johnson became the executive director of the Berkeley Symphony Orchestra. Brought into "resuscitate" the organization, one of the first works Johnson helped stage was the Zappa Affair, a showcase of music by Frank Zappa. Critics praised the Zappa Affair and it brought the symphony global recognition, but Johnson did not look back at the production fondly. He'd refer to it later as "the nightmare of 1984." "When I started we were six weeks out from a major project with Frank Zappa and were in way over our heads," Johnson wrote. The symphony initially conceived the show as a night of Frank Zappa music with a budget of $20,000. But the budget ballooned to over $130,000 after Zappa, music director Kent Nagano, and others came up with costly additions like life-sized puppets and moving stage sets. The production threatened to sink the orchestra, but Johnson kept it going. Johnson worked at the orchestra until 1997, when he left to follow his dream of playing piano for a living. For years following his so-called "retirement," he performed at retirement homes around the Bay Area. But his acrobatic childhood caught up with him. By the time he was in his 70s, Johnson was in a lot of pain. Arthritis wracked his body, forcing him to depend on a walker and later a wheelchair for movement. In his last days he needed to use oxygen tanks to supplement his breathing. After requesting end-of-life drugs last year, his request was approved in April. He announced his decision at a party at his apartment, where friends like Nalley danced, sang and played music. He held a similar party two nights before he ended his life. Videos of the event (see above) show Johnson sitting on a couch, surrounded by friends, while Nalley and her accompanist Tammy Hall played "stream-of-conscious style" for the small crowd. It was at one of those parties that Nalley said she had her most memorable conversation with Johnson. After having his application approved by the state, Nalley says Johnson's condition improved, both mentally and physically — thanks to new pain medication. Talking with Nalley, he was appreciative of being able to control how he died and not be a burden to his family, she said. "He felt blessed that he could go surrounded by the people he loved," Nalley said, "and surrounded by music and art, especially."